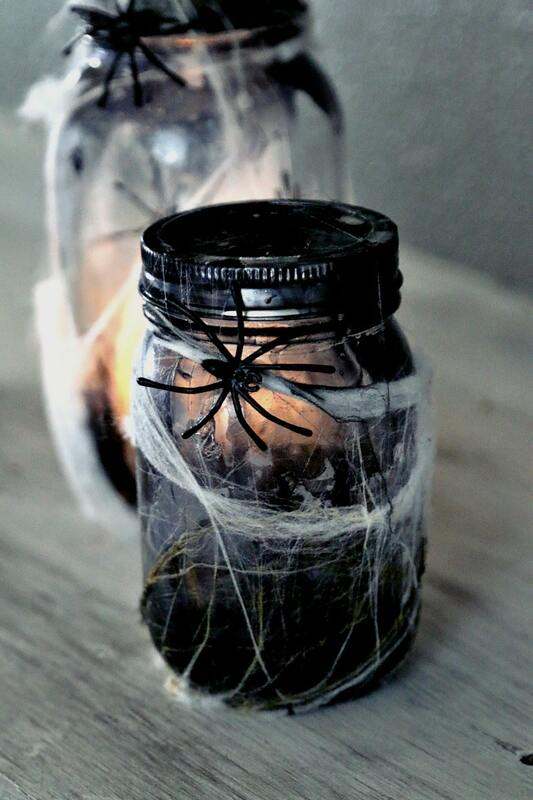 “Catch a Spider by its Toe”: Light Up Mason Jar – Learn how to make a super spooky Halloween decoration to light up a hall table, mantel or bedroom this Halloween! 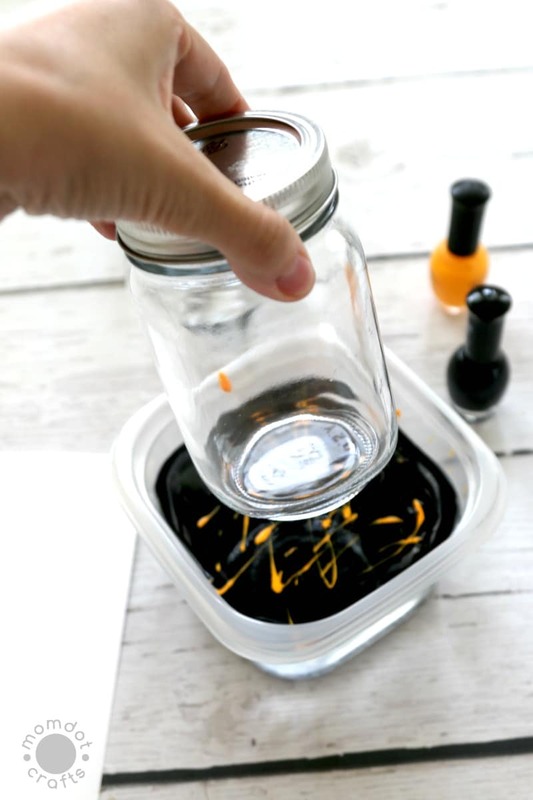 Scroll below for step by step instructions on this mason jar craft and get started today. Ready to get Halloween decorating? 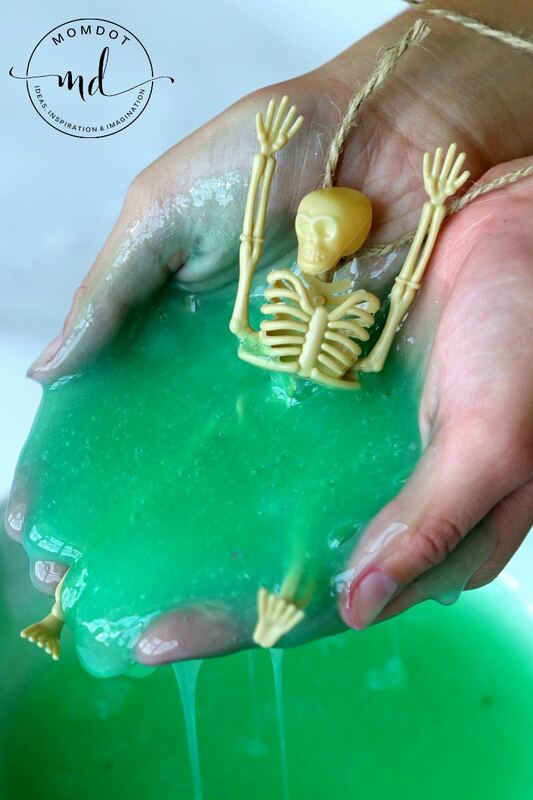 It’s probably a little too early to put it in your window (your neighbors may think you have lost it) but it’s not too early to get started on some custom homemade Halloween crafts that will make your house pop with personality for the upcoming holidays. When you are done with this one, make sure you visit this Frankenstein Mason Jar Luminary Jar too. 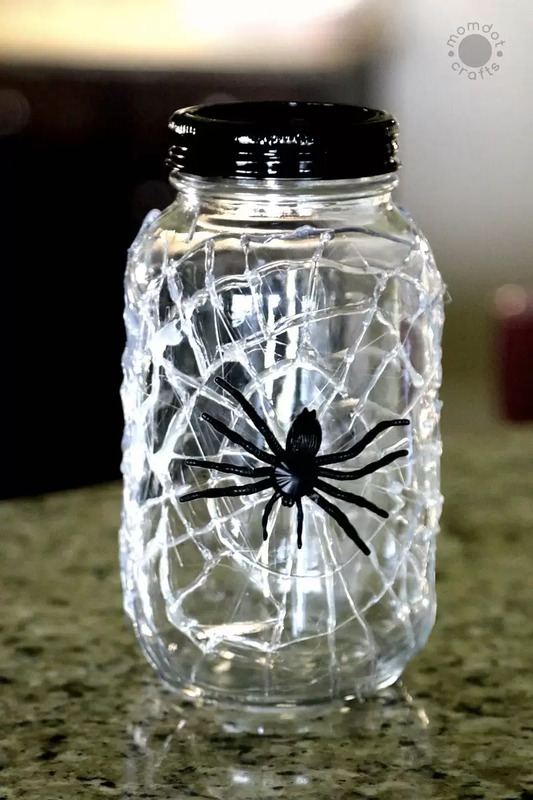 Perfect for party decor, this Creepy Crawly Spider Jar that lights up the night, plays on the just right amount of fears by aging your mason jar and then adding what we are all scared of the most: Spiders ! This looks so fantastic in the middle of a great Halloween centerpiece but also makes a pretty good Halloween night light in a bathroom. The first thing with a mason jar is that you need to age it to make it creepy. One of the best ways I have found to do this is to use nail polish. Simply pour in some black nail polish and swish the water around so it spreads to a flat layer of black. Now dip your jar in on the bottom and then turn around and do the top. This will leave the middle of the jar clear for spider viewing but give you some good age on the top and bottom of the jar itself. 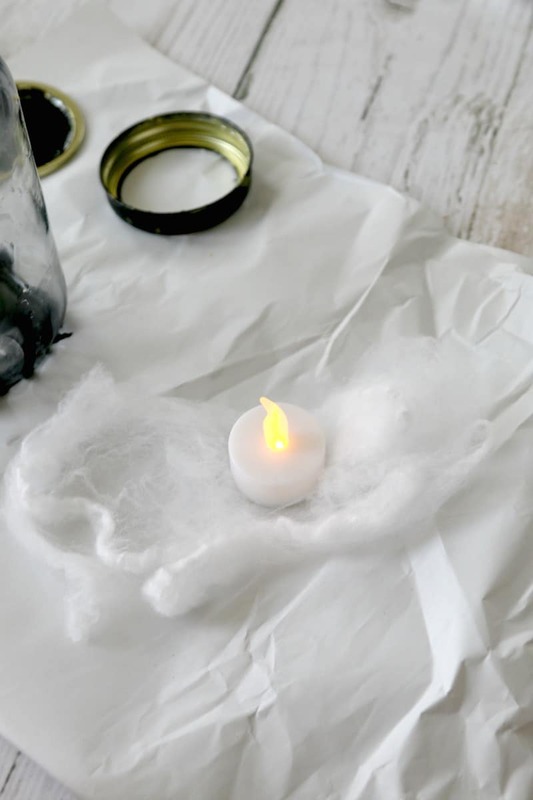 While your jar is drying, put a flameless tea light on the bottom of your jar. I used tongs to place mine. 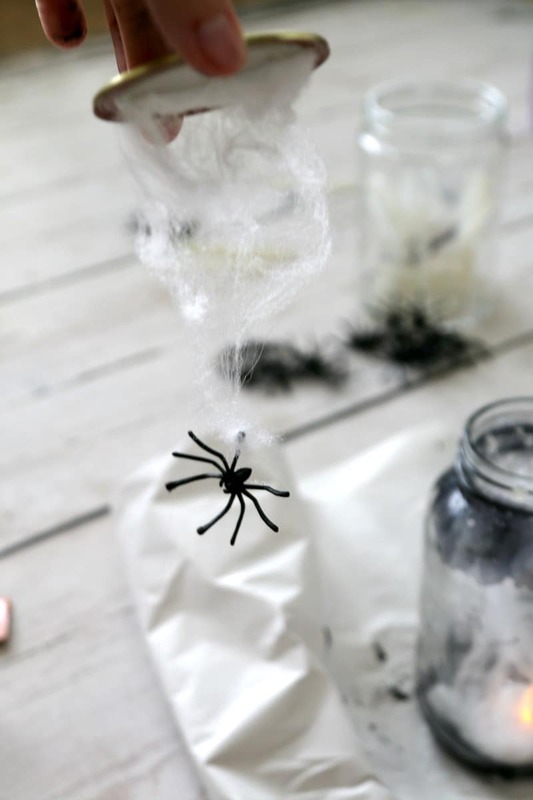 Then spread fake spider web into the jar, securing with a few drops of hot glue inside the lid or top and bottom of jar. You can use a straw or stick to push it down all the way to secure. Now drop spiders and affix with hot glue in strategic spots. For this set, I loved how it looked but decided to add additional creepy factor by looping a few times with more fake spider web around it in thin areas. The first picture is my light up jar and it looks equally awesome in a dark room as well as in the bright light. The second smaller jar does NOT have a light in it so the focus is more on the actual Halloween decor itself. 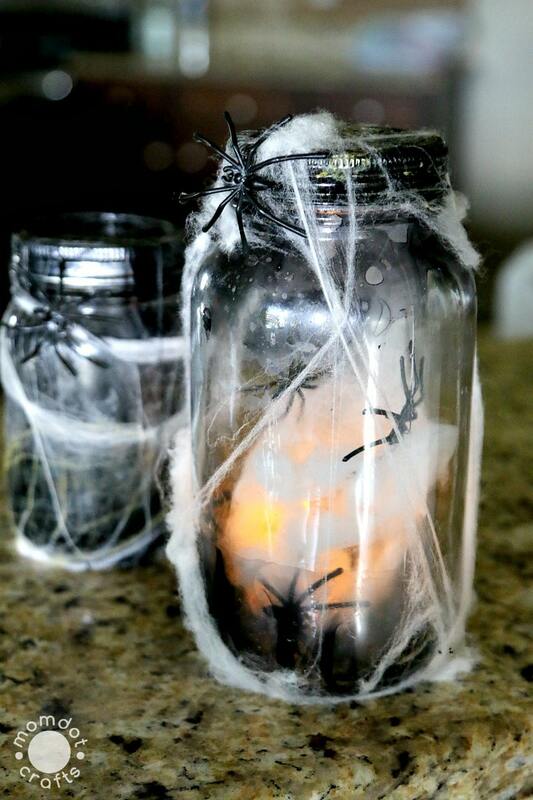 Looking for another Halloween Mason Jar Craft? I did a super simple Spider Web Mason Jar that you can have ready to go in just a few minutes!